What are some of the best flies for high country trout? With trout stockings galore in the high country, now is a great time to learn fly fishing! This is looking like a good window of weekend weather for catching high country trout or bass in desert lakes. Note, however, as of Thursday afternoon there were still road closures on SR-87, as well as I-40, due to the Tinder Fire. See the latest road closures map from ADOT and find the best route to your fishing hole. Coming off a full moon, the majority of largemouth bass are likely in a post-spawn mode — weaker and hungry. With steady, hot temperatures forecast ahead, bass fishing could really bust loose at our desert impoundments. Water temperatures at lakes such as Bartlett and Roosevelt are in the low- to-mid 70s. Best bets for largemouth: Roosevelt, Bartlett, Alamo, and Havasu. Striped bass hot spots can be Pleasant, Powell, Mead or Havasu. Crappie anglers can fish at night under submersible lights at Roosevelt, Bartlett or Alamo. This is a good time to target catfish, too. Try Saguaro, Pleasant, Bartlett, Roosevelt, Alamo, or Havasu, where our Catch of the Week (below) was just hooked. Fish days or nights right now for Mr. Whiskers. 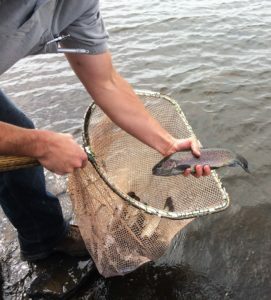 Big Lake was stocked Monday with 3,000 “supercatchable” trout that average 13 inches. See a Big Lake report. Knoll Lake on the Mogollon Rim will not be stocked due to the Tinder Fire, which originated April 27, about 1.5 miles from Blue Ridge (C.C. Cragin) Reservoir. Water levels already were very low at Blue Ridge and we do not plan on stocking it this year. Riggs Flat Lake on Mt. Graham will not be stocked this week as scheduled due to poor water quality. The lake is open, however, and there have been recent reports of anglers catching their limits of trout. There are 57 fire restrictions statewide. See all the restrictions. one will be selected as Catch of the Week. 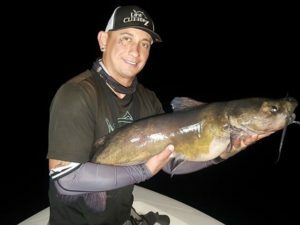 George T. with his reported 19.13-pound, 35-36 inch channel catfish taken from Lake Havasu on Saturday night. Read more about the catch. During the events, loaner rods are provided, bait is free, and no license is required to those who register during event hours. Free Family and Community Fishing Event. 8 a.m. – noon. 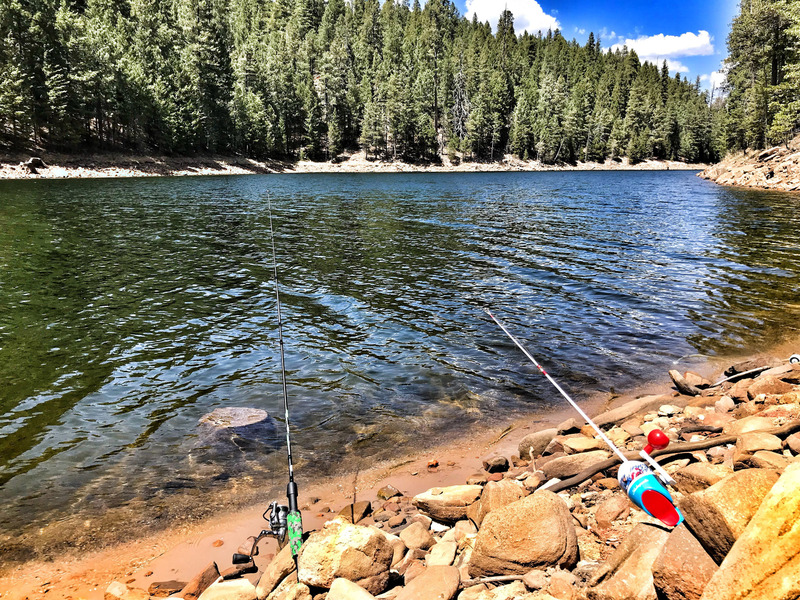 Woodland Lake Park in Pinetop-Lakeside, The Arizona Game and Fish Department along with the Town of Pinetop-Lakeside will host a free fishing clinic. The lake is scheduled to be stocked with trout just prior to the clinic, so the fishing should be good. Arizona Game and Fish will have a limited number of fishing poles, tackle and bait available for public use during the clinic. This is a great opportunity to come out to Woodland Lake and learn how to fish. No preregistration is necessary. Call Arizona Game and Fish Department’s Pinetop Regional Office at 928-532-3680 for more information.